Launched in 2013 as a trademarked, alternative celebration of music and vinyl culture, Vinyl Day is returning for its sixth year on June 16! Stronger than ever, this whole-day affair by music and lifestyle brand Satchmi celebrates the iconic music format and serves as a valuable reminder of how music is a social affair. Join us as Satchmi in partnership with Levi’s and Sun Cellular as they embark on another musical mission this June 16 at The Axon, Green Sun from 12NN to 12MN (11AM to 12MN if you’re a Satchmi Club loyalty card member*). Vinyl Day orbits around the brand’s biggest vinyl market featuring a vast, intergalactic selection of records up to 50% off as well as Motorino turntables up to 20% off! Like a rare celestial event, this biggest Satchmi sale is a once-in-a-year occurrence that cannot be missed, especially with this year’s official venue sponsor Green Sun, official TV partner MTV, and Jack Daniel’s. Expect a stellar line-up of musical acts from the headliners who are fresh off their 20th Anniversary last April, Sandwich! They are set to perform alongside equally amazing acts such as Ben&Ben, Quest, Munimuni, Ourselves The Elves, Flying Ipis, BP Valenzuela, She’s Only Sixteen, Taken by Cars, Carousel Casualties, and Lions and Acrobats. 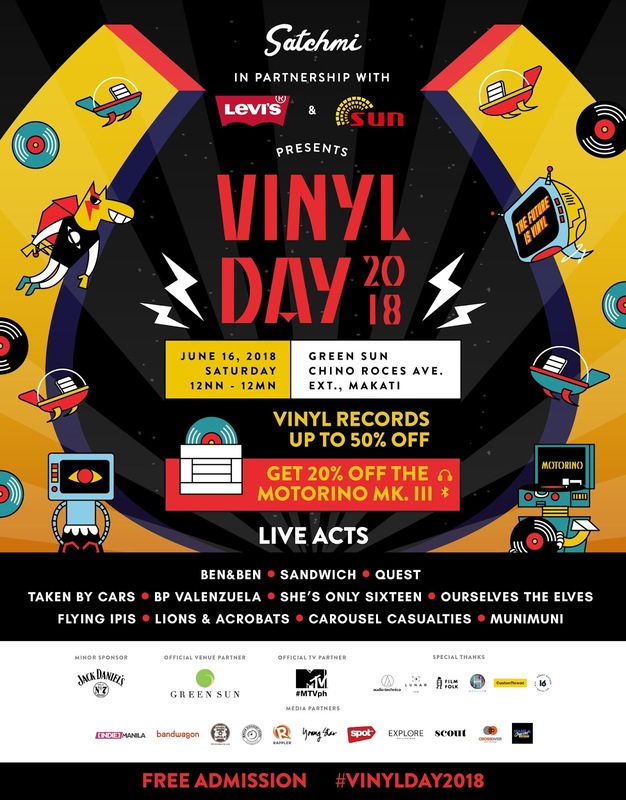 Because it is a culmination of not just vinyl but the ultimate Satchmi lifestyle experience, Vinyl Day welcomes spectators, connoisseurs, and collectors of all kind—from vinyl and film to coffee and clothing. Satchmi’s friends from the local community like Film Folk, Homonym, Customthread, Audio Technica, and more are popping up exclusively for this one-day event. Also get ready to be shot and filmed by Lunar and the photographers from Sunny16 Lab. See you at Vinyl Day 2018 which will run from 12NN to 12AM on June 16 at The Axon, Green Sun, 2285 Chino Roces Ave. Ext., Makati. Being an all-inclusive brand, the event is open to all beings and planets of every kind for free . Remember, THE FUTURE IS VINYL. Check out Satchmi Vinyl Day for details. *For loyalty card inquiries, check out here.